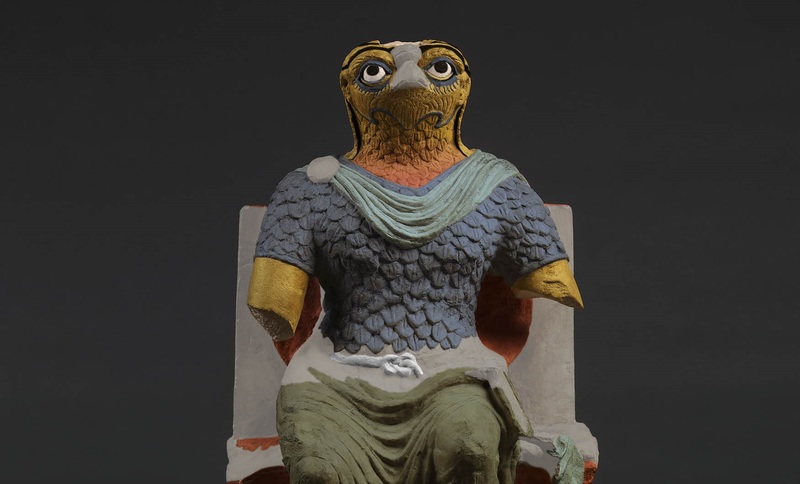 While preparing the limestone sculpture of Horus for display, Curator Elisabeth R. O’Connell had a chance to work with British Museum Scientist Joanne Dyer to identify some of the pigments that were used on the sculpture. Along with some additional analysis using an innovative imaging technique to detect pigment in areas not visible to the naked eye, the pair was able to suggest a colour reconstruction. Here Elisabeth discusses the outcome. A colour reconstruction based on pigment analysis suggests how the statue originally may have looked. (Photo: (c) The Trustees of the British Museum). ‘That’s one weird looking bird,’ grinned an American student on one of my tours of the Ancient Egypt and Sudan Department study collection for university students last year. And to Egyptology students he is. And to students of Classical Archaeology too. But that’s rather the point. Roman Egypt (30 BC-AD 642) witnessed some of the most interesting, innovative and transformative combinations of traditions in the ancient world. The god sits casually on his throne, one sandal-clad foot forward, his knees apart and draped in a garment. From the waist down, he could be any of a number of senior Olympian deities, or Roman emperors masquerading as such. He wears a feathered mail armour shirt that ends just above his elbows. His arms, now broken off, would have held symbols of power, perhaps an orb and sceptre. His cloak, pushed back over his shoulders, is fastened with a circular broach. From the waist up, his costume belongs to military deities and, especially, Roman emperors, who were also worshipped in temples dedicated to them throughout the empire. The head, however, places us firmly in an Egyptian context. It’s Horus, the sun god and divine representative of the living king in ancient Egyptian tradition. His head is that of a falcon, rendered in naturalistic style with the bird’s distinctive facial markings articulated by the carving and also traces of paint. His eyes, however, are strangely human; instead of being placed on the sides of the head, like any ‘real’ bird, they are frontal, and his incised pupils tilt his gaze upward. In an imaginative turn, the feathers of the falcon’s neck blend into the scales of the mail shirt. In the top of his head is a hole, into which a (probably metal) crown once fit. Big Bird, as I think of him, has been off public display since 1996 when the gallery he was formerly displayed in was reconfigured to create the Great Court. Since I arrived at the Museum in 2007, he’s been the culmination of my tours for university students, giving us the opportunity to explore cultural identity through different kinds of objects from Roman Egypt. We look at magical papyri written in Egyptian and Greek, with some of the Egyptian words written in Old Coptic, that is, the Egyptian language written in Greek script. Why the glosses of Egyptian words in Greek script? Because in magical spells it was very important to say the words correctly or else the spell wouldn’t work. And Greek script, unlike Egyptian, represented the vowels ensuring that the words said aloud were accurately pronounced at a time when literacy in Egyptian scripts was on the wane. We also look at mummy portraits belonging firmly in the Roman tradition of individualised commemorative portraiture, but made for the specific purpose of placing over the face of a mummy, a feature that belongs unmistakably to Egyptian funerary practice. We see the same combination of traditions in this limestone sculpture of Horus and other contemporary depictions. The opportunity to get the sculpture on public display arose last year when the Gayer-Anderson cat was scheduled to travel to Paris, then Shetland, for exhibition. Big Bird would get his very own case at the top of a ramp, amid other sculpture more readily identifiable as ‘Egyptian’ in the British Museum Egyptian Sculpture Gallery. While preparing the display, we also had a chance to identify some of the pigments that are apparent to the naked eye: his yellow arms, black pupils and ‘eye-liner,’ garments in two different shades of green, and his red and black throne. Using an innovative imaging technique, we were also able to detect the pigment used for his armour, and it turned out to be one of the most valued pigments of the ancient world, Egyptian blue. Although no longer apparent to the naked eye, it shows up in visible-induced luminescence imaging by British Museum scientist, Joanne Dyer. In addition to the strange (to us) combination of Graeco-Roman-Egyptian elements, he would also have been rather garishly painted. Horus – I should really stop thinking of him as Big Bird – will not go back into the study collection when the Gayer-Anderson cat returns, but instead join a touring exhibition on the Roman Empire which will give visitors to the exhibition in locations including Bristol, Norwich and Coventry, that is, in former Roman Britain, an opportunity to see a selection of objects from Antinoupolis and other cities from the former empire’s southern frontier, Roman Egypt. For their collaboration and enthusiasm, I thank Joanne Dyer, Tracey Sweek, Michelle Hercules, Antony Simpson, Susan Holmes, Paul Goodhead, Robert Frith, Evan York, Emily Taylor and Kathleen Scott from the American Research Center in Egypt.